As you may be aware the governing body of The Maelor School have been looking at various options to refresh our school uniform. There have been a number of concerns raised that at one time the uniform was the smartest in the local area, but over time other schools have improved upon theirs and The Maelor School no longer expresses its excellent standards through its uniform. 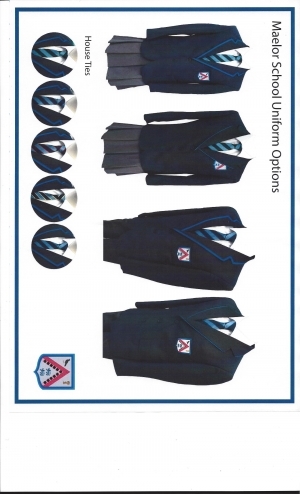 The proposed new uniform would be for next year’s year 7 only and therefore will not incur costs for existing pupils and their parents. The uniform consists of a Navy Blue blazer with a lighter blue trim. There are two possible versions of this that are under consideration. The blazer will be worn with grey trousers or skirts (available from our suppliers or from any major supermarket). The school tie will have individual house colours as diagonal stripes through it. The remaining parts of the uniform would remain unchanged including the sports kit. The deadline for completing this consultation is Friday 6th February in preparation for our governors’ meeting the following Monday.